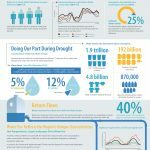 SACRAMENTO, Calif. – The Regional Water Authority has released a new infographic highlighting water use and efficiency progress in the Sacramento region since 2000. Before the drought, water use in the Sacramento region remained steady despite a 25 percent increase in population. During the drought, Sacramento-area residents and businesses contributed 12 percent of the state’s total savings (with only 5 percent of the state’s total population). More than 40 percent of the water used in the Sacramento region is returned to the watershed and local waterways to benefit people and the environment downstream, decreasing the area’s net water use. The primary factors that drive water use in the Sacramento region are summer’s hot temperatures and large landscapes. In winter, when sprinklers are turned off, the region’s water use is comparable to other communities throughout California and the statewide average for residential per-person water use. Most Sacramento-area water providers are 100 percent metered and have been for years. The less than 10 percent of water accounts that remain to be metered are on track to finish by 2025 or earlier.